Mother’s Day will soon be here and the Friends of Annapolis Pool Society is hosting its second annual Mother’s Day Brunch at the Annapolis Royal Fire Hall on Sunday, May 8th, 2016. 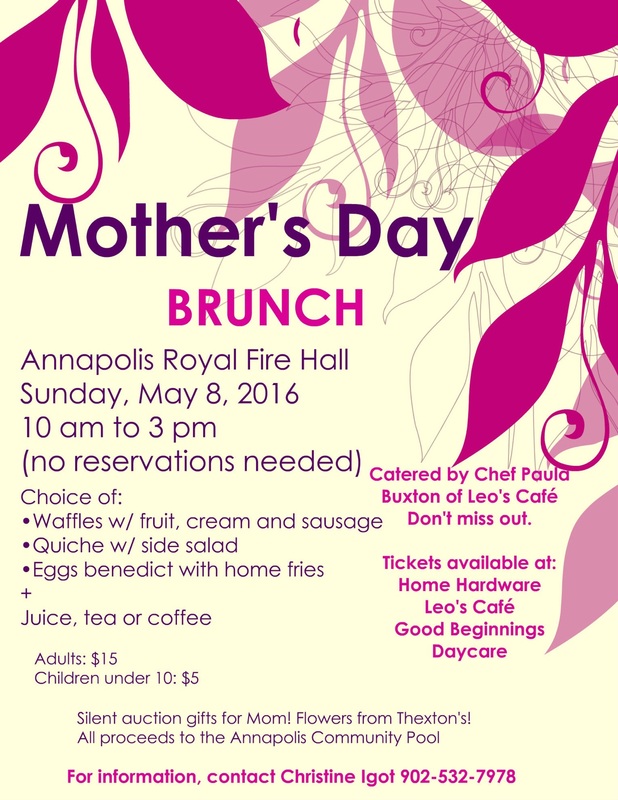 Chef Paula Buxton of Leo’s Café will do a wonderful repeat performance of last year’s menu choices ( waffles or quiche or eggs benedict) and there will be a Chinese auction with some lovely gifts for Mom. You could win a prize from Mrs. Nicholson Home ! As well, Thexton’s flowers will adorn the tables and be up for sale. You do not need reservations but tickets are already available at the Annapolis Royal Home Hardware Building Centre, Good Beginnings Daycare and from me, Christine Igot, at 532-7978. Tickets are $15 for adults and $5 for children under 10. You can come and eat anytime between 10 am and 3 pm. All proceeds go to the running of Annapolis Royal’s outdoor community swimming pool. Open this Friday for Christmas shopping ! We are all dressed up for Christmas as Mrs. Nicholson Home and will be open this Friday, December 11th, from 3 pm to 7 pm for tax-free shopping ! Jane will make her famous mince tarts and we will have hot apple cider. 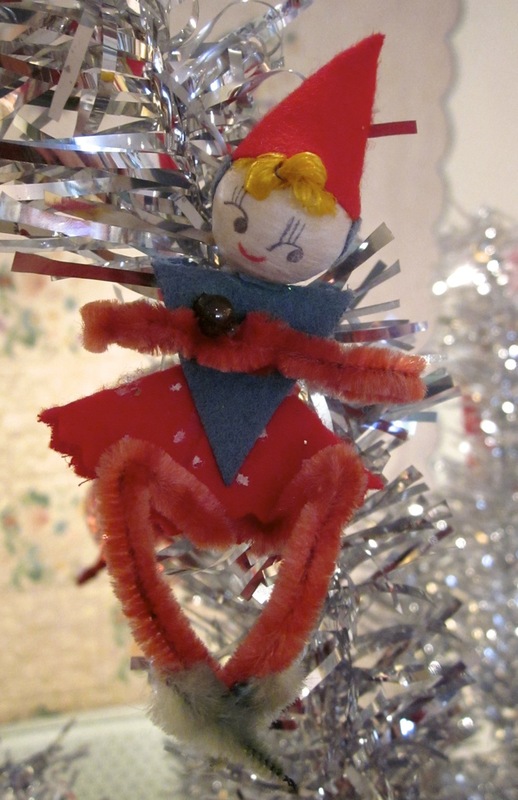 We have lots of vintage Christmas tree ornaments, some lovely antique dolls who need a new home and lots of new Michel Design Works Christmas kitchen towels and soaps. We also have beeswax candles and votives from our local bees! We hope you will come on in and say hi! We will also be open this Saturday from 10 to 3pm and next Saturday the 19th from 10-3 pm. All for tax-free shopping. there is something for everyone on your list ! We are sorry to say we will be closed, exceptionally, this Sunday, September 20th. Our brother Jim, who died suddenly in June, will now have his ashes buried in New Brunswick this Sunday and we will be with family. Mrs. Nicholson Home will be open again on Tuesday, September 22nd. We will also be closing for the season on Saturday, October 10th. However, we will POP open in December for some early Christmas shopping and we will keep you posted as to dates. Talk on Willliam Morris -today! Today, as part of the week-long Arts Unleashed! 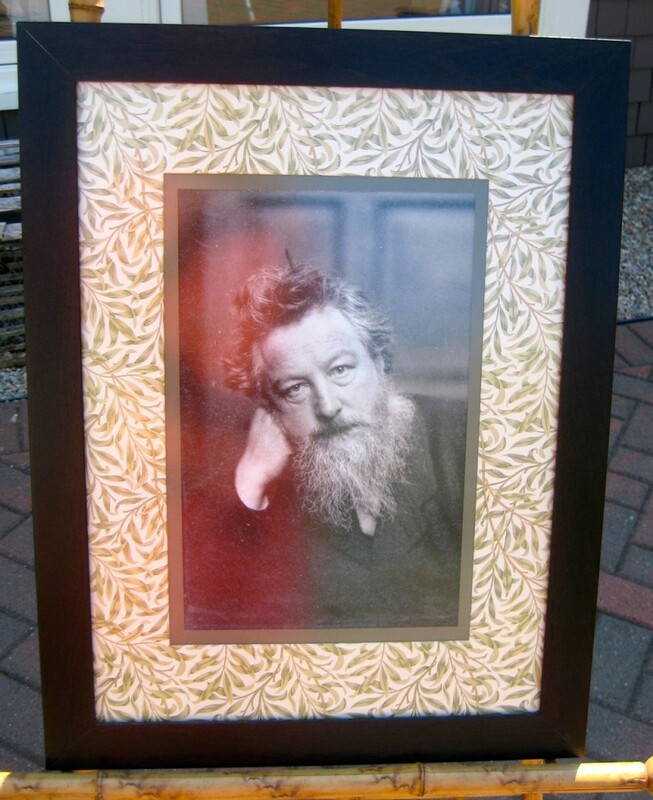 festival, I will be giving a talk on William Morris, the founder of the British Arts and Crafts movement. Morris believed in art in everyday life and beauty in useful objects. I’ll talk about his life and have lots of books and show and tell on hand. The talk will begin at 3 pm. A great day in Annapolis today with the market and Paint the Town. 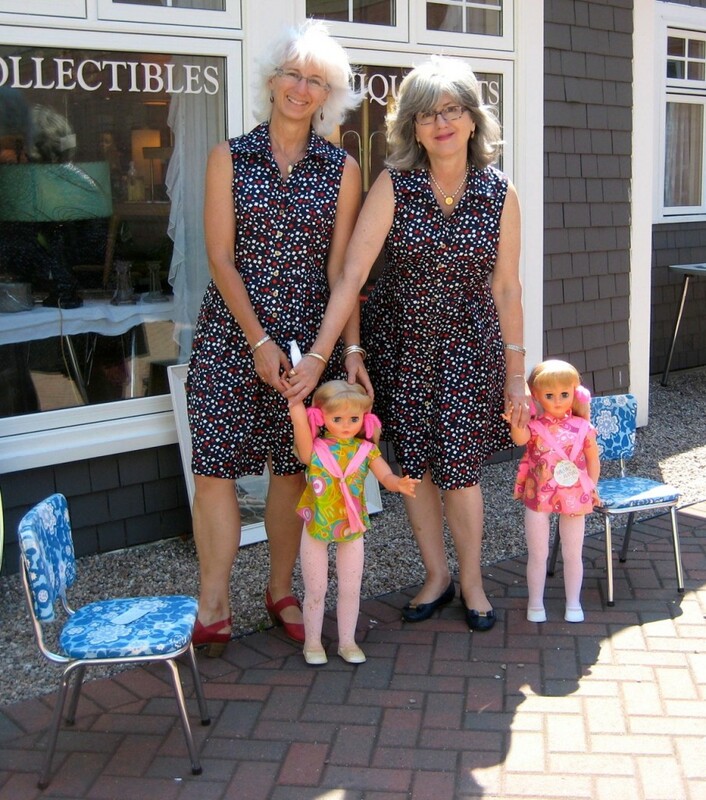 We wore our “famous” sister dresses and these two dolls did too! What a festival of nine days we are about to have! It all begins this weekend with the 20th anniversary of “Paint the Town”. Over 70 artists will roam the streets of our historic town to paint. The finished works will be auctioned off every evening (Saturday and Sunday) at the Legion. The next week is filled with demonstrations, workshops, exhibits and talks all through the town. From an introductory Cricket Workshop on the 15th to Scallop Jewellery demos at Fancy Jewellers on the 20th to a Snap the Town Photo Walk with Terry Murphy on the 22nd and much more! I will be giving a talk on the famous English founder of the arts and crafts movement and designer William Morris here at Mrs. Nicholson Home on Tuesday, August 18th at 3 pm. 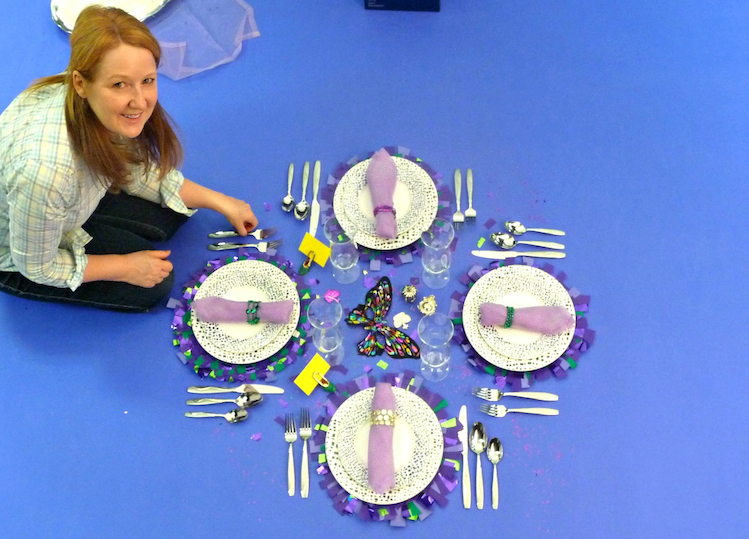 And here at MNH on Thursday, August 20th at 3pm, designer Monica Forrestall will talk about setting a Stylish Seaside Table. The week of activities ends with our new Festival of Dance Annapolis Royal (FODAR) now in its second year. See you here in the tiny perfect town! Across Canada, for this long weekend, communities celebrate their birthday! Of course, here in the Tiny Perfect Town there will be loads of things going on all weekend and into the holiday Monday. 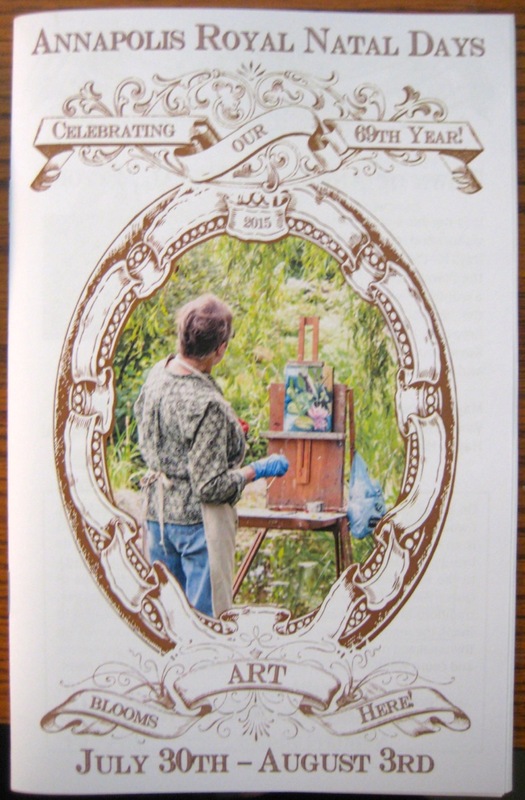 Natal Day events programme available at Mrs. Nicholson Home. This lighthouse matters! We did it. 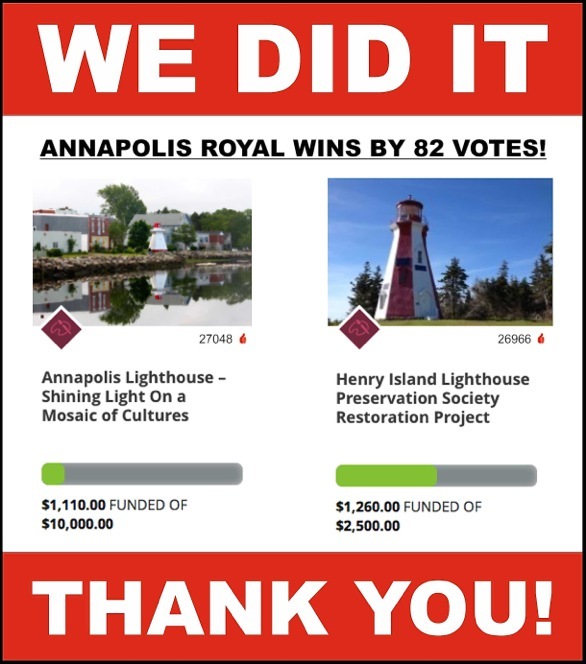 Congratulations to Durline and Alan Melanson for spurring us all on in the final days to win the social media campaign for “This Lighthouse Matters” Contest organized by the National Trust for Canada. We received a total of 27,048 votes – the most out of all 26 lighthouses in this competition winning by only 82 votes in the final minutes! The Historical Association of Annapolis Royal will receive $40,000 for preservation repairs so our landmark in the centre of the “tiny perfect town” will continue to shine! 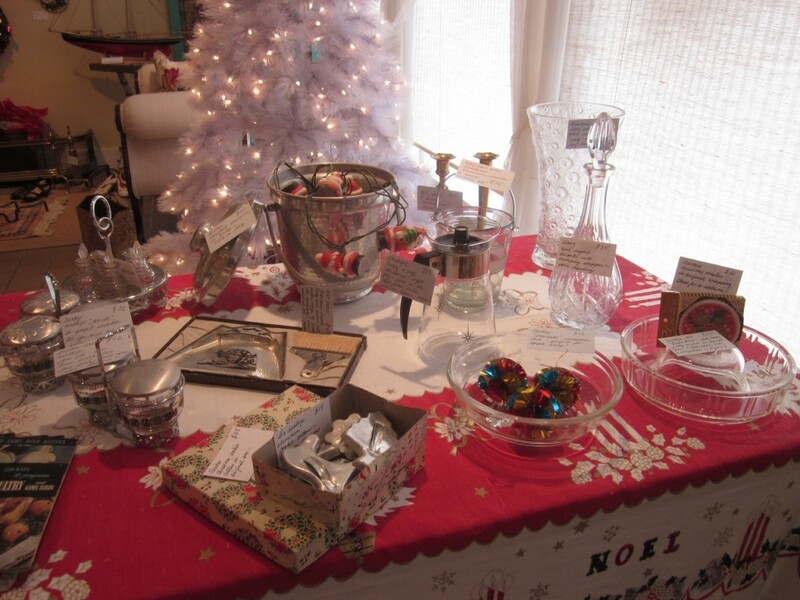 Mrs. Nicholson Home will be open tomorrow night, Friday December 12th from 4 to 7 pm for tax-free Christmas Shopping! We have decorated the store with vintage Christmas ornaments and there are lots of wonderful gifts. Stop by for some Christmas treats and to say hello ! We will also be open on Saturday from 9:30 to 3:30 BUT take advantage of the tax free only on Friday evening.